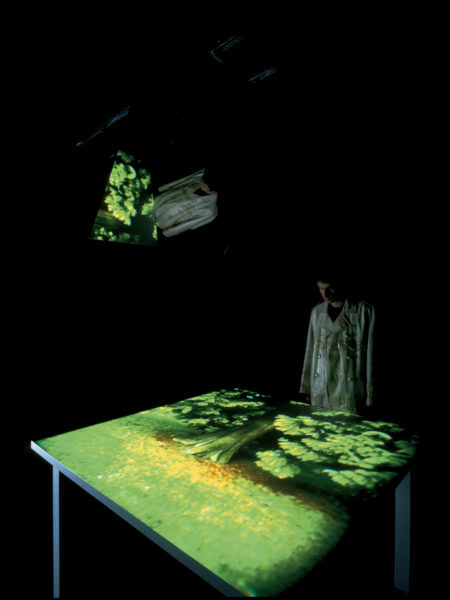 A white table measuring 34 h. x 60 x 60 inches is positioned in the center of a completely black/light-locked 15-ft. square room. 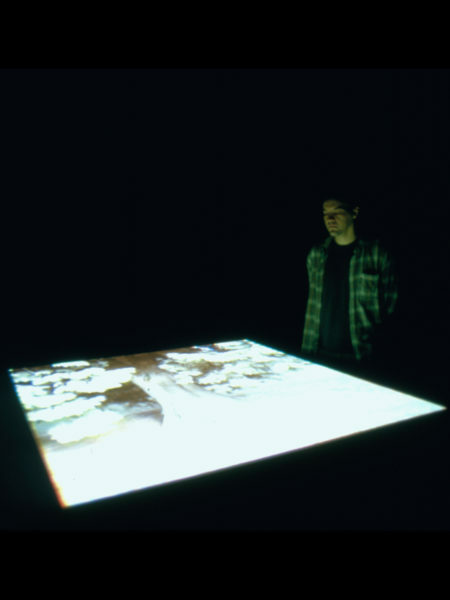 Prosaic video images are projected and refracted off a large mirror mounted on the ceiling at a 45-degree angle down to the surface of the table, filling it edge to edge. The picture’s orientation changes from scene to scene. A spoken text fills the space and is broken up by patterns of increasing and decreasing spaces of silence. All the words and parts of words remain intelligible as they are pulled apart and pushed back together like an accordion. A strobe light is synchronized to the patterns of the speech, sometimes as rapid pulses or as a continuous burst of extremely bright light, obliterating the site of the image and exposing the viewers present. 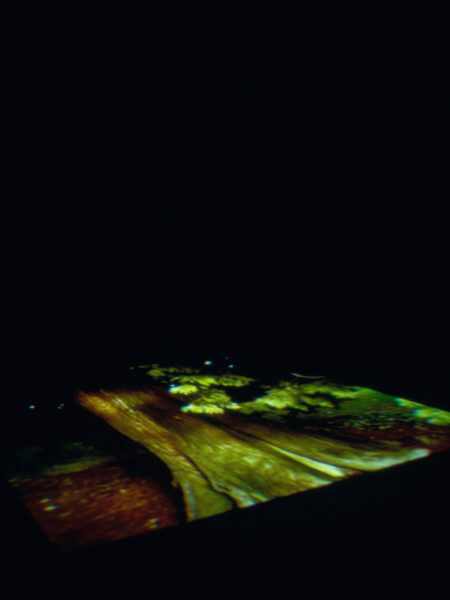 This is the first work in which Hill utilized a strobe light (note: Dervish, 1993-95 implicitly uses strobe lights in lieu of standard projection bulbs for the projectors). Since then he has used similar techniques in Midnight Crossing, 1997; the performance Splayed Mind Out, 1997; 23:59:59:29 - The Storyteller's Room, 1998; Cabin Fever, 1999; Wall Piece, 2000; Unconditional Surrender, 2008 and The Slow Torque of Bonsai, 2017. Wall Piece uses excerpts from the same text. An example of this work was first exhibited in a solo exhibition at White Cube, London, England, December 13, 1996 – January 25, 1997. “Grand Opening,” Montevideo/TBA, Amsterdam, The Netherlands, December 12, 1997 – January 10, 1998. Solo exhibition. Musée d’art contemporain de Montréal, Quebec, Canada, January 30 – May 3, 1998. Solo exhibition. Rice University Art Gallery, Houston, Texas, February 27 – April 12, 1998. Solo exhibition. Donald Young Gallery, Seattle, Washington, May 16 – August 15, 1998. Solo exhibition. Center for Contemporary Images, Saint-Gervais Genève, Switzerland, September 5 – October 11, 1998. Solo exhibition. “A Name, A Kind of Chamber, Two Weapons & A Still Life,” Barbara Gladstone Gallery, New York, New York, September 18 – October 30, 1999. 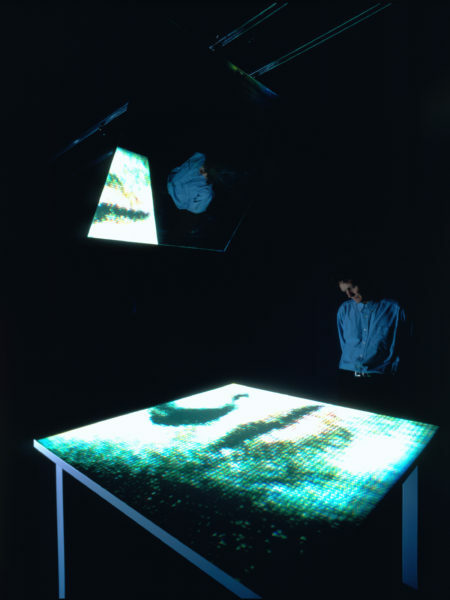 “media art 2000: escape,” media_city seoul 2000, Seoul Metropolitan Museum, Seoul, Korea, September 2 – November 15, 2000. 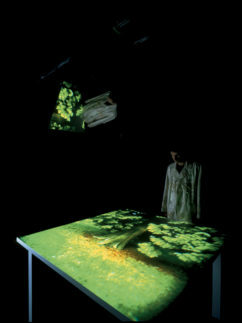 “Update #8,” Kunstmuseum Wolfsburg, Wolfsburg, Germany, February 6, 2004 – Spring 2004. Quasha, George and Charles Stein. Tall Ships. Gary Hill’s Projective Installations 2. Barrytown, New York: Station Hill Arts, 1997, pp. 7, 8. Liesbrock, Heinz. Gary Hill: Midnight Crossing. Münster: Westfälischer Kunstverein, 1997, pp. 17 – 21. Barrett, David. “Gary Hill: White Cube, London.” Art Monthly 203 (February 1997), p. 22. Hürzeler, Catherine. “Kann man auf abstrakte Weise surfen? Ein Gespräch mit dem Videokünstler Gary Hill.” Das Kunst-Bulletin 9 (September 1997), pp. 16, 17. Bélisle, Josée. Gary Hill. Montreal: Musée d’art contemporain de Montréal, 1998, pp. 9, 13, 18, 19, 55. Aquin, Stephanie. “Gary Hill – Vague de fond.” Voir, Montreal (February 12, 1998), p. 25. Campeau, Sylvain. “Epistémologie de la réalité visuelle: Musée d’Art Contemporain, Montréal.” Vie des Arts, Montreal 42, 170 (Spring 1998), p. 82. Tougas, Colette. “Gary Hill. Musée d’art contemporain de Montréal, 30 janvier – 26 avril.” Parachute 90 (April - June 1998), p. 43. Bellemare-Brière, Véronique. “Gary Hill – La vidéo reine au MAC.” Séquences, Montreal 196 (May – June 1998), p. 55. Stadler, Matthew. “A Theater of Perception. Picture This.” The Stranger, Seattle (June 18 – 24, 1998), p. 27. La Chance, Michaël. “Vidéognose.” Spirale, Montreal (May – June 1998), pp. 12 – 13. Sarrazin, Stephen. “Things Fall Apart: Gary Hill & Meg Stuart (with Damaged Goods) ‘Splayed Mind Out’/Gary Hill: Installations and Videotapes.” Intercommunication 25 (Summer 1998), p. 83. Shaviro, Steven. “Fringe Research.” Artbyte 1, 4 (October/November 1998), pp. 14 – 15. Bellemare-Brière, Véronique. “La vidéo s’éclate.” Esse, Montreal 4 (1998), pp. 4, 5. Yablonsky, Linda. “Medium Cool.” Time Out, New York 210 (September 30 – October 7, 1999), p. 67. Chung, Yong-do. “Gary Hill: New Art Language Marking History of Reason. ” Art, Korea (October 2000), pp. cover, 9, 141 (in Korean). media_city seoul 2000. (Seoul: media_city seoul 2000 Organizing Committee, 2000), pp. 36 – 37, 84 – 85. Gary Hill en Argentina: textos, ensayos, dialogos. Buenos Aires: Centro Cultural Recoleta, 2000, p. 18. Gary Hill: Instalaciones. Córdoba: Ediciones Museo Caraffa, 2000, p. 7. Quasha, George and Charles Stein. La performance elle-même in Gary Hill: Around & About: A Performative View. Paris: Éditions du Regard, 2001, pp. 4, 28 – 31, 38, 83, 102. Gary Hill: Selected Works and catalogue raisonné. (Wolfsburg: Kunstmuseum Wolfsburg, 2002), pp. 21 – 23, 28, 37, 39, 205 – 207, 240. Thély, Nicolas. “Gary Hill: Vidéographe.” Beaux Arts 213 (February 2002), p. 36. White Cube. Volumes I and II. Göttingen: Steidl Publishers, 2002, Volume I, unpaginated, Volume II, pp. 100 – 101. Barro, David. Gary Hill: Poeta da percepção, poet of perception, poeta de la percepción. In Portuguese, Spanish and English. Porto: Mimesis, 2003, pp. 16, 38, 48, 60. Shaw, Jeffrey and Peter Weibel, eds. Future Cinema: The Cinematic Imaginary after Film. Karlsruhe: ZKM and Cambridge: MIT Press, 2003, pp. 310 - 311. Diez, Renato. “Gary Hill: Immagini contro parole.” Arte 380 (April 2005), pp. 98 – 104. Daniel, Noel, ed. Broken Screen: 26 Conversations with Doug Aitken: Expanding the Image, Breaking the Narrative. New York: D.A.P./Distributed Art Publishers, 2006, p. 160 – 161. Quasha, George and Charles Stein. An Art of Limina: Gary Hill’s Works and Writings. Barcelona: Ediciones Polígrafa, 2009, pp. 27, 371, 411 – 413, 416, 448, 449, 452, 453, 589, 625. Note: Text is heard considerably broken up, however upon repeated listening about 90% is comprehensible. A word is worth point zero zero one pictures. To be transfixed is no longer an option. I am in a way blind. I live time through a succession of pictures I've known since when. But it’s precisely this when that haunts--it eats out the looking cavities and smiles inward like a Cheshire cat. What I might name as "the immediate surroundings" has all but vanished. I can only imagine a centripetal point that calls out numbers. As it stands--I have no place. No feet. I've lost the vague idea of limbs. Legs feel more like logs arranged for fire. A small pipe organ made of glass infiltrates the body. Music. I know it but can’t place it. I live the threat of broken glass penetrating skin from the inside out. I remember a dream of holding the other's heart in my hand; for a moment I live the pulse of another being. Then it was over and I gave it away to a hungry animal. Lush sensations have ceased. I have no mouth, no scream, no voice within. I only listen to an imaginary sound I might make. I am supersonic and alien. I have the feeling of being a fuselage. Am I walking? Dreaming? Sitting in a chair? Killing? Eating? Could it not be any of these, any and all simultaneously? Where am I? I can't remember at will. It can only be described as holy for fear of something completely other. Parts come back not quite like what was before, but the connection is certain. A few switches flipped, that's it. The wherewithal generator is next to close by--happening right before my hands. I'm synthesized. Thought--that tree that won't let go brings to mind the terrifying possibility: it’s only words that separate things. I feel abandoned by the real, leaving what's left. I'm going. I’m watching myself go. Everything's changing speed, backing into itself. The effect mesmerizes. Movement eludes me. I'm paralyzed. Waiting awaits what's left. It’s doing exactly what it says. No question. No questions. Circumstance is at a standstill. Things have exited. If I go everything will have already followed. I know it. It knows it. There is nothing to leave. Nothing. Difference exists only through sound, a wall of sound. Can I go through it? Can I go through with it? Where is it now, where does it reside? What does it feed on? Why does it flicker? Nothing approximates its speed. It’s something from the outside. Way outside. I didn't think this. This is not me. I’m not accountable. It wasn’t thought out. It has no relation to thought. This is that hole that everything must pass through. I’m going now before it comes. Will I know when it comes? Will it approach with signals? Will there be a moment of recognition? Is that when I am it? Am I simply tapping myself on the shoulder? What is the point? It’s always there, on again; on again. It waits without pathos. Waiting is human. This point wants to show me something inhuman. It wants to bring me to my knees. It wants me to pray. It wants me to see through seeing, it wants me to act like knowledge. It wants acknowledgment. It wants me completely at the edge. It burrows itself in, blow ups and begin again. Plural. Points. Cells. Each and every one autonomous in perfect orbit; holding fast. Why? What prevents meltdown. I live. Why? There is still the liquidity of everything; it runs in place of numbers. The tree of whens lost its leaves. All stones have been left turned. I throw one, it skips, walks on water; meets its own reflection in a way that propels it to its next reflexive moment...and so on...across the abyss...and little by little, little divides: I should become someone else and proceed accordingly. I walk around the world a few times. Big parallel lines tunnel through pulling up points of entry and exit. Two nodal hemispheres play havoc in the skull. Thoughts can't help but mince, and suddenly I’m beside myself entertaining a party of two, only to fall back a few steps, a few words gone by, a few instructions on how to get from point A to point B. Points, known only by the needle that records everything.